For the past several years E-ink has been talking up possible niche uses for E-ink screens, including sunlight-readable displays for motor bikes and bicycles. To the best of my knowledge, no gadget maker has stepped up to serve this niche market, so one hacker has developed his own solution. David Schneider's a bicyclist, and he was recently inspired to build a bike computer for people who don't like to squint. He writes over at IEE Spectrum that he grew frustrated by products which either had screens to small to read or were to expensive for his tastes, so he decided to build his own. 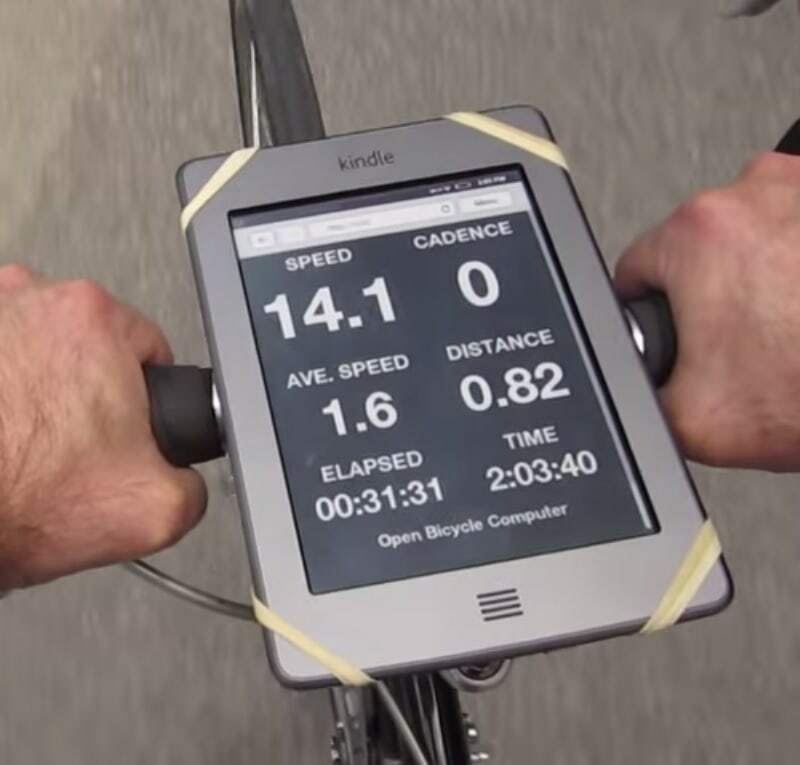 As you can see in the following video, Schneider has combined a Kindle Touch with a Raspberry Pi to build the ultimate bike computer. The Pi reads in data from the sensors (GPS and two reed switches, crunches the numbers, and then posts the data to a webpage that the Pi serves up on a local Wifi network. The Kindle Touch access that network and displays the page in its web browser. It's not that simple, of course. Schneider says that he had to install a long list of software for this to work. He also had to find a way to trick the Kindle into thinking it was connected to Amazon's servers (otherwise it refused to connect to the Pi's Wifi network). In the end, I managed to pull together a system that shows distance, instantaneous speed, average speed, cadence, elapsed time, and clock time all at once, with digits large enough to read without squinting. Swiping and pressing buttons brings up other screens that offer such goodies as real-time mapping and logging. Even if you have to buy a Kindle for this project, the cost of the hardware involved is probably less than half what you’d be paying for a commercial unit with these capabilities. You can find more details over at the IEE Spectrum site.